Too often companies opt for generic corporate photography and stock imagery, and while these images have a valuable place in some industries, they can make your brand look disingenuous, indifferent or just plain boring if used too frequently and without much consideration. It’s equally important not to rely solely on copy as a means of conveying a message. After all, users only read an average of 20% of any given webpage. Therefore, the images used on such a page will need to do most of the talking. The internet is now such a busy and competitive space that it has become crucial for brands to make an impactful and memorable impression on potential customers. Incorporating illustration into your branding is one way to do that. In this article, we’ll delve into some of the brands distinguishing themselves from the competition with illustrative content and explore why this imagery works so well. Ecommerce brand Etsy uses brand colours throughout its illustrative content to tie in with its logo. The rustic tones of orange reflect the handmade nature of the products made by independent artists and businesses listed on its website. I was captivated by Etsy’s quirky illustrative style, which incorporates a combination of different shapes, characters and objects to imitate the unique qualities of the items for sale on the platform. The overall effect is contemplative and friendly, emphasising to the user that Etsy is a safe and trusted place for creatives to sell their work online. On the brand’s social channels, posts are reserved for showcasing stand-out products and sellers rather than illustrative content. Team collaboration tool Slack uses bold colour without restraint, resulting in illustrative content that’s engaging and memorable from the moment you land on its homepage. I particularly like the inclusion of characters within a scene, and I find myself taking more time to explore the images and their relation to the copy beside them. An occasional angular layout adds movement to the images and, in turn, emphasises the dynamic environment in which the software was designed to be used. A slightly different illustrative style has been adopted on Slack’s social channels, but the colouring and use of the company logo ties it back to the overall brand identity nicely. You won’t miss Mailchimp‘s illustrations in a hurry; partly due to the incredibly bright shade of yellow they have adopted, and partly due to the quirky, hand-drawn nature of the images themselves. The energetic, sketchy style encapsulates an impression of speed, which goes hand-in-hand with the brand’s mission to make email marketing as quick and easy as possible for its subscribers. It is clear to see that Mailchimp have made a huge effort to carry this styling through to their other marketing channels, which gives the brand a consistent voice. Work management platform Asana includes an illustrated ‘tour’ feature, as well as a number of spot illustrations and animations elsewhere on its website. Predominantly constructed using simple shapes and a limited palette of a few brand colours, these illustrations are easy to understand and help to represent the basics of each topic. The simplicity of the imagery here reinforces that the platform itself is as simple to use as it is to learn about. While Asana uses a softer approach with the illustrations on its website, images that are posted on its social channels are made to stand out with the addition of black outlining. This serves to differentiate the style used on each of Asana’s channels without altering any other part of their design or character templates. If you’re looking for full-screen illustration with an impact, look no further than the Salesforce website. Each of their featured products comes with its own unique landscape background, complete with Salesforce mascots participating in activities related to that topic. The bright colours and sense of depth make the website especially memorable, and the placement of information has been well thought-out so as to strike a balance between these elements. The product pages are designed as entry points leading to further, more complex information, which explains the dominance of imagery over copy at this point in the customer journey. Had this design been carried throughout the entire website, it would be overwhelming, particularly for users with accessibility needs. On Salesforce’s social channels, illustrated landscapes are ever-present – if less focal – leaving room for other visual elements such as copy, CTAs and photography. I really enjoy the styling of Headspace‘s illustrations, particularly the inclusion of little characters and the simple orange and blue colour scheme. The focus on the characters’ wide smiles combined with plenty of rounded shapes gives the brand the friendly and encouraging feel aligned with their positive tone of voice. 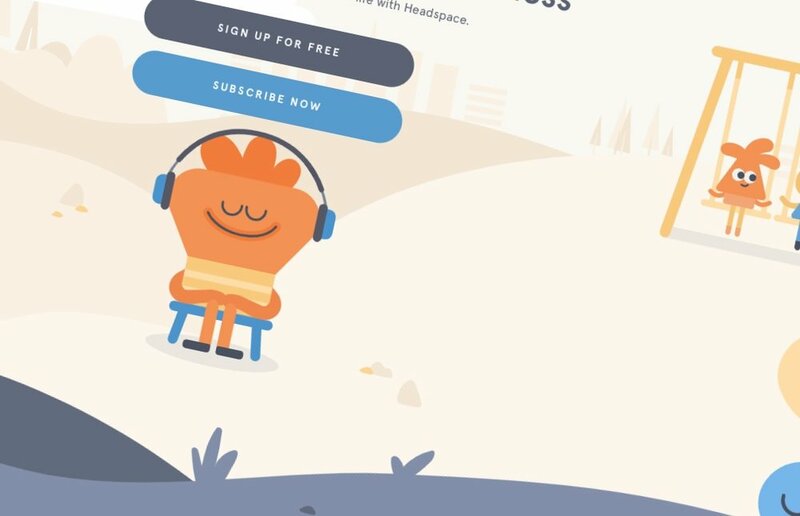 I particularly like the way that each character has its own individual appearance, reinforcing the idea that Headspace is an app that can be used by anyone and everyone to achieve a sense of mindfulness. I was also impressed with the consistency of style across their social channels, mixed with some photographic content to back up more tangible topics. Logo design that meets all of the six design principles isn’t a luxury, it’s a necessity for anyone trying to tell a story. It doesn’t take an experienced graphic designer to spot a cheap logo design - and the average consumer is savvier than you think. Just for one second, consider some of the world’s most recognisable logos. Did you just think of the McDonald’s “M”? the Nike swoosh? Or the Apple with a bite taken? All of these logos are really simple. Many famous logos are even revised to become even simpler. What exactly spells out the difference between complexity and simplicity in logo design. A confusing logo can be caused by the use of too many colours, detailed images, intricate fonts, or excessive superfluous elements. A logo with extraordinarily complex design doesn’t make your brand look high-class or fancy. It means your graphic designer didn’t understand the value of simplicity. •	Can this logo be printed in a single colour? Just black and white? •	Is this logo’s message retained if it’s shrunk down to no more than 2 cm in either direction? •	Would the logo look too bland or boring if it were blown up to the size of a billboard? There are major trends in the fields of graphic design and branding, fuelled primarily by consumer demand. Should you ignore the latest graphic design trends, or avoid incorporating fleeting factors like Pantone’s colour of the year into your branding? - Almost certainly. The world’s most beautiful and effective logos are almost timeless in their design. If your mission is to communicate your brand’s hipness factor, there are more efficient ways to do this than derivative design. Take the example below of the BMW logo. Their original logo designed in 1916 hasn’t changed too much, only being occasionally refreshed stylistically to keep things fresh. The best logo designs in the world communicate an entire brand in one single glance. The greatest logos have a story to tell, which is why they’re generally unique. While it’s extraordinarily difficult to define memorable design, it’s certain to have a few factors. It’s likely to be slightly surprising, without jarring the viewer. It’s addictive and appealing to look at. Your logo’s primary and secondary colours should reflect who you are as an organisation. All of the fundamental principles of graphic design work together, with the help of colour and typography, to communicate a message. If one factor is significantly off or ignored, your message will be obscured by poor design. And more likely than not, the result will be upsetting, confusing, or just plain cheap company logos. A poorly designed logo with insufficient contrast can be difficult for individuals with visual disorders to navigate. An imbalanced logo design upsets the natural human attraction to patterns. Proximity and alignment work to direct the viewers’ eyes appropriately. Rebranding is difficult. It’s challenging, expensive, and doesn’t always work. Even on massive budgets, there are some very high-profile cases of logo fails and rebranding disasters. If you are looking for professional logo design on a budget, be sure to check our affordable logo design services go to : The Logo Design Page on this website. Follow our Instagram Account to see just s few of our Logo Designs. If you're thinking about becoming a graphic designer, then – there has never been a better time. The world is your oyster if you know how to visually communicate ideas that inspire, inform or engage people. You're in demand too. The creative industries alone rake in £87.4billion each year to the UK economy. In 2015, there were 2.9million creative jobs. And the future is only looking brighter. The UK could become the leading hub for the world's creative industries within a generation, according to the CBI. We've seen demand for graphic design courses skyrocket over the last five years, with a surge of new students joining campuses in the UK, Australia and North America. Read on to learn why a career in graphic design could be the best decision you've ever made. Millions of UK workers are at risk of being replaced by robots within 15 years, a study claims. It's depressing news for many, but if you learn something that machines could never do, then you'll be future-proofing your career for many decades to come. Graphic design is creative and requires human-led intelligence and ideas to respond to trends, tastes and what has already been before. It will never be something a robot can mimic. Sure, the technology to create will continue to make our lives easier as designers, but they'll never replace us. Never. You've heard about the Millennials; now it's time to learn about Generation Z – those born between 1995 and 2002. Academic, economist and author Noreena Hertz calls them "Generation K", inspired by Katniss Everdeen of The Hunger Games. She wrote in her article for The Guardian: "Like Katniss, they feel the world they inhabit is one of perpetual struggle – dystopian, unequal and harsh." You can't blame them really. They were born in "the shadow of economic decline, job insecurity, increasing inequality and a lack of financial optimism." It's an anxious generation. But what's interesting about Generation K (along with the Millennials) is that they're hugely creative. They love to make things, hack things, and create something new. They're inspired by everything around them – and this is where you and your graphic design skills come into play. Whilst we're on the subject of Katniss Everdeen and Generation K, you should know that these people don't trust brands or traditional big business. Which is why design and branding matter more than ever before. The need to create visuals that will attract and win over this tough crowd will ensure design is treated with the respect it deserves. It will be your job as a designer to help win hearts and minds through your creativity. How exciting is that! Technology is cheaper and more accessible. The Internet offers a wealth of inspiration and ongoing learning. Feedback from others can be found in an instant. There has literally never been a better time to design for yourself. Heck, you can even start your own side business and sell your own greeting cards if that's what you want to do. In fact, once you become a graphic designer, you'll find that your new-found skills will translate to many other parts of your life. You can get really creative once you have an eye for layouts, symmetry, grids and lines. If you're feeling adventurous and want to secure a job overseas, then graphic design is in demand everywhere. In Australia, it's a profession that gives you a good chance of qualifying for a skilled visa. If showing off is your thing, and you want to see your name (or work) in lights, then graphic design is a huge boost to the ego. Your designs could literally be seen by millions – online, on the street, in newspapers and magazines, on packaging. The world's eyes will be on your creativity. And there's something truly magical about that. Gone are the days when you could enjoy a "job for life". Today, you'll be lucky if you can stay anywhere for more than five years. Reassuringly, graphic design gives you skills that are in demand and can apply to many different career paths. They're transferable. One minute you could be working at a design studio, the next – you're working in-house for a large brand. At time of writing this article, there are over a thousand jobs in graphic design on Monster UK. According to the latest findings in Neuroscience, your brain reaches its peak performance between 16-25 years, and that's when cognitive functioning declines. Bummer. The good news is that we can train our brain to perform better. It's a muscle, after all, and therefore needs regular exercise. Well, graphic design makes your brain very active. It forces you to problem-solve every day, which challenges you and consequently ensures you're performing at your best capacity. If you want to keep your brain strong, healthy and perhaps smarter, then graphic design can help. Struggling with a little creative block? Try these lateral thinking brain teasers and logic games to get the creative juices flowing again. The world is most definitely a dark place right now. But despite this, there is always something to smile about. Graphic design gives us the daily opportunity to embrace our surroundings, think creatively and absorb the most beautiful things life has to offer. It's a wonderful career – one that you could argue doesn't even feel like a job. From thinking up colour palettes and solving the next big problem... from choosing the perfect font to happily agonising over the best-weighted paper... graphic design is a wonderful thing. Apart from refining your typography skills and understanding how to translate a sentiment into an appealing brochure, a career in graphic design will most likely teach you how to be your own boss. Many designers learn the ropes of entrepreneurship when they work for a studio or agency, particularly if the company is small and they get to see first-hand the daily struggles and challenges. You might find one day that you fancy a little more independence by going freelance. The benefits of freelancing can be endless. It won't be easy, that's for sure. But isn't it reassuring to know that if the robots haven't taken over in future, you can look forward to a different path – one of many routes open to you, now that you're a graphic designer? What a great time to be creative. Thinking of printing your illustration on Product? Most creatives today are familiar with working only on screen. While the benefits of creating work digitally are endless, there is a certain satisfaction to holding a piece of your own work in your hands. This is where printing your own merchandise can come in. Printing on your own product can be quite the daunting experience. What would you print and how many? What works best a vinyl sticker or a pin badge? And most importantly, would anyone buy it? With over 500 merchandisable products to choose from, it can be a tough decsion. There are many positives to creating merchandise of your creative work. Whether you’re just starting out and want to trial your new product with a run of ten notebooks, or you’re investing in a 100 custom t-shirts. The profits should come rolling in after some potential good investment in marketing. Also having said that once one item is seen by another, who knows how far it could go. One person could be a walking canvas and an awesome advert for your artwork. This also creates a sense of community, which can broaden maybe choosing to sell items at print fairs which is not only an opportunity to sell work, but also to meet customers and creatives from further afield. One group of creatives who regularly utilise their digital work by printing it on merchandise are illustrators. Illustrators of any drawing style take the time to really think about their audience before jumping in. Who are you selling to? To avoid making any mistakes, utilise your social media as a tool for research. Often merchandise ideas go to a poll on Instagram stories, or out to a Twitter poll. It’s an awesome way to gauge interest in your product before committing to an order. If you need any help in setting up artwork for print or help with graphics for your new project I am only too happy to help. Just contact me. I look forward to seeing your new designs in print! As website designers, it’s our duty to create design with great user experience. And it isn’t easy. Here are some best practices for UX for website design projects. Making the experience of the website memorable is more important than what the website says. Website users often forget the data and salient points of content, but they will remember how it made them feel. It works in advertisements, why not use it on website content? Website graphics, layout, text, and interactive elements work in synergy to present the user with an experience, not just present them with information. UX website design is a consequential piece of application and website design work. Making your website page stand out from the sheer quantity of websites and information on the internet is essential. Modern website designs contain more visual and interactive qualities to strike at more emotional responses to help them stand out in the highly competitive website world. Making your web page scannable will appeal to your website audience. Most will scan the content for something that strikes them and then they switch to reading when they want to find out more. Constantly reconsider what your app or site can do to make it easier to use. Part of the website design is making it highly usable for the majority of users and allowing for extra functionality to be hidden and made discoverable as it is needed, not shown all at once. Also providing a clear, consistent design is simpler for web users. They can then know what to expect when you are reusing colours, behaviours, and aesthetics which reduces the need for them to figure out the interface. When users are familiar with some of the aspects of the web design it makes the process clearer and easier to use. When design elements are common elsewhere, don’t reinvent them by becoming creative with new UI patterns. Making users think too hard to figure out your UI interface is not what you want. You want to have a familiar looking interface where standard objects like links stand out as links, and login access is located in the upper right. There is no need to relocate such standardised components. Creativity with standardised patterns can make your interface hard to work with and not promote website design usability. Although you may think non-traditional is cool, it may make it harder for users to navigate and thus it falls into a problem area. Design, creativity and web usability need to have a balance. URLs, button, and navigation placement need to focus on usability before web design. Its best to focus on the layout of these first without the design in mind, then add the creative elements. You must have a good idea of who the web audience is for the intended website or app before you create it. How to best design the interface will come from them. Once you have a clear idea of the audience for your website or app, you can then find out their needs and wants, and design the perfect design that will meet their desires. The competition can show you some ideas of how this was done. Note the competition’s colours, layout, style, and features. Credible - Website Users must believe and trust what you tell them. Be contextual - Be sure to mark where users are in their path through the interface. Be human - Be trustworthy, transparent, and approachable with human interaction preferred over machine interaction. Be discoverable - Be sure users can accomplish their tasks the first time they visit. Be learnable - Be sure that interaction is easy and moving through product is seamless. Be sure that on subsequent visits users can accomplish their goals. Be efficient - On repeat visits can they accomplish repetitive tasks quickly and easily? Be delightful - Be sure that product delights users so that they have an emotional connection to it and champion your product. Be a performer - Be sure that the system performs well when users are interacting with it. UIs need to be simple to navigate, easy to use, and created with the proper colours and fonts for your audience. Don’t forget to integrate end-user feedback while remaining consistent throughout the website design. You can no longer present less information on your mobile site than on your desktop site. Your content has to be identical on both, because, soon, you will only rank based on the information on your mobile page.